Iowa State University hosted the Midwest Big Data Summer School in June, attracting nearly 150 participants from universities and organizations around the Midwest. The week-long course introduced early-career researchers to data-driven research. “We had three big goals for the Summer School. First, to illustrate that Big Data is everywhere, but is only useful if you understand the context for the data. Second, detailing the life cycle of Big Data, from acquisition to visualization to communicating results. Third, explaining ‘Big Data speak,’ or the key terminology used by statisticians, computer scientists, and Big Data researchers,” said Hridesh Rajan, Iowa State professor of computer science and co-organizer of the Midwest Big Data Summer School. Pavan Aduri, Iowa State professor of computer science, also was co-organizer of the Summer School. Summer School speakers covered a broad range of Big Data topics, including the Big Data paradigm shift, the challenge of education and engagement with Big Data, data visualization and challenges and solutions in acquiring data. Participants also learned about programming languages R and Python, machine learning, methods and tools for text mining, and using scalable tools for text mining, among other topics. With support from the National Science Foundation-funded Midwest Big Data Hub (MBDH), participants traveled from more than 20 universities and government and industry research organizations. 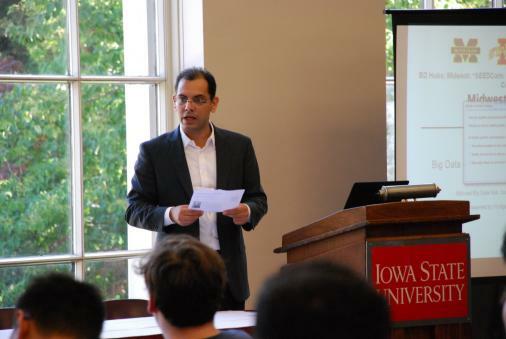 The Midwest Big Data Summer School was supported by Iowa State University’s College of Liberal Arts, Office of the Vice President for Research, Department of Computer Science and Department of Statistics, industry partners Kingland and Workiva, and the Computing Community Consortium, an organization that seeks to promote innovative, high impact research in the field of computing. Iowa State University is one of five universities that created the Midwest Big Data Hub in 2015 with support from the National Science Foundation (award 1550320). The Midwest Big Data Hub creates effective cross-sector communities that can harness the power of data to address societal problems of relevance in the Midwest and be a driver for regional economic development. Midwest Big Data Hub researchers are dedicated to meeting the challenges of collecting, managing, mining, storing and analyzing the huge and complex data sets created by today’s research, government and commercial activities.